One of the most interesting wagers that has crept into the market in recent times is Next Manager betting. This can be looked at in a number of ways, such as which will be the next manager to get the sack, which manager will be the next to takeover at a specific club and which manager will win the Manager of the Month award, though the latter is far less common. Traditionally, though, it’s definitely the first one that is the most common for punters to go for. There are many reasons for placing a bet on a topic like this. Sometimes it’s because you’re heard a rumour through the grapevine that a manager is about to be appointed. Others it’s a case of wishful thinking, hoping above hope that your club’s manager, who you think is dreadful, is about to be given the bullet. Whatever the reason, this is where I’ll have a little look at what you’re betting on, how it works and what sort of thing you should take into account before you actually place your bet. What is a Next Manager Bet? You’ll notice that they’ve opted for the slightly more vague wording of ‘Next Manager To Leave His Post’, meaning that they are covered should a manager choose to leave to take a different job elsewhere or, as is more common nowadays, leave due to ‘mutual consent’. In short, you’re betting on which club will be the next to be seeking a new manager because the one they had isn’t in his post any more. 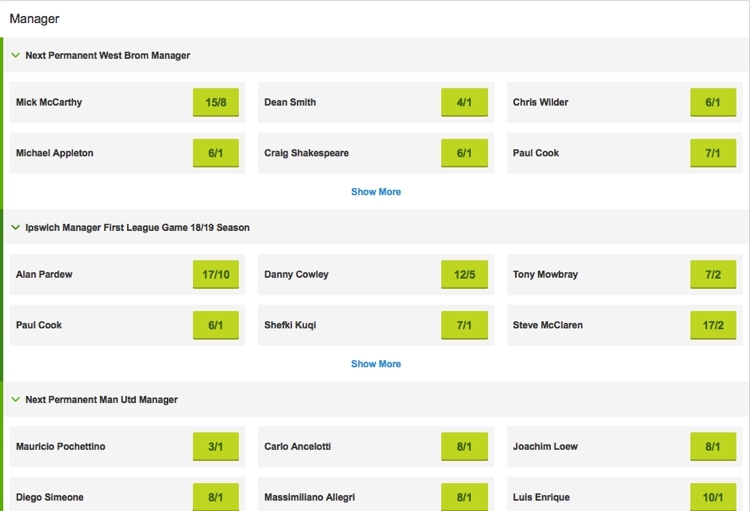 When it comes to betting on the Next Manager to Leave Their Post market you’ll notice that every manager in the relevant league is listed, such is the ever-changing nature of football. The most successful manager in the world might be huge odds to leave their post, but then because of their success they could be offered an international position that no one was expecting and people will be furious that they didn’t have the chance to bet on them. When it comes to the Next Permanent Manager market, however, things can be a lot more circumspect. In the history of football a manager hasn’t been appointed before the previous manager was sacked, including when Gerard Houlliér took over at Liverpool after a spell as joint-manager alongside Roy Evans. That’s why this betting market tends to feature specific clubs that are either looking for a new manager because they’ve sacked their previous one already – such as West Bromwich Albion in the Paddy Power example – or because the manager in position has a reputation for moving on from jobs relatively quickly – step forward José Mourinho. Here you’re betting on the person that will be appointed as the next permanent manager of the chosen club, meaning that caretaker managers don’t count towards the betting. Interestingly, most bookmakers say in their small print that neither caretaker nor interim managers will count towards this market ‘unless they complete at least 10 competitive games’. Something worth remembering. Arguably the most important thing you’ll want to think about in terms of the Next Manager To Leave Their Post bet is how regularly a club tends to sack managers. One of the obviously places to start as far as that discussion is concerned is Chelsea, with the London club tending to have a rapid turnover of the man in charge in their recent history. Since the Russian oligarch Roman Abramovich took over the club in 2003, he has been in charge for fifteen seasons. During that time twelve different people have sat in the dugout, with both José Mourinho and Guus Hiddink doing so more than once. Admittedly, Steve Holland and Ray Wilkins were only in charge for one game apiece, but it’s still true that the Russian has a very short fuse when it comes to his managers. As long as he’s in charge of the club, therefore, the manager will never feel all that comfortable. Another thing to think about along the same lines is the manager themselves. Are they the sort of person that tends to move on from a post after only a short period in charge? For Example, before taking over at Manchester United the longest amount of time that the aforementioned Mourinho had been at a club was three years. In spite of his relative success, the Portuguese coach tends to burn bridges rather quickly and leave before he’s pushed. If he’s been at a club for around the three year mark, therefore, it might be worth wondering how much longer he’ll last. The final consideration revolves around a manager’s relative success. Is the club that he’s managing really struggling? Are they flirting with relegation? If so, it’s entirely possible that those in charge might decide to pull the plug before it’s too late. That’s why the managers of clubs around the relegation zone tend to feature most prominently in the Next To Leave market. Conversely, if they’re doing really well then might an international side come calling? Those managers that are particularly proud of their nationality might be most at risk of leaving should their country’s football association decide to give them a ring. Alternatively, if a bigger club like Manchester City, Real Madrid or Bayern Munich are interested then that’s a hard call to resist. This market can be split into two different categories: clubs that have already sacked their boss and clubs that seem likely to do so. Regardless of which one you’re looking at, the process that you’ll want to go through before placing your bet is essentially the same. The first thing you’ll want to do is look at the size of the club. If you’re talking about a team that is usually at the top end of the table then it’s extremely unlikely that they’ll be signing a manager who is more used to saving teams from relegation. Roy Hodgson’s appointment as Liverpool boss is the exception that proves the rule on that front, for example. Likewise a team that struggles to stay in the division is unlikely to be able to appoint someone that is thought of in the group of ‘best manager in the world’. The noises that a football club makes about its future can also help you narrow down a list of possible appointees, too. If they’re talking about wanting to establish a specific brand of football and no longer play defensively then you’re unlikely to see Tony Pulis throwing his (baseball) hat into the ring. If the owners are talking about survival being the most important point for them, on the other hand, then Pulis is a master at exactly that sort of football. He’s never going to be a legacy manager but he’s an excellent firefighter. Some football clubs have a long-standing tradition of playing a specific type of football, so managers that don’t do that won’t be high on the list of interviewees. Much like Hodgson at Liverpool, David Moyes, Louis van Gaal, José Mourinho at Manchester United are the exceptions that prove the rule. Have any clubs sacked their manager already? If you know that there’s a vacancy at a given club then it’s always worth thinking about which manager might be heading there next. 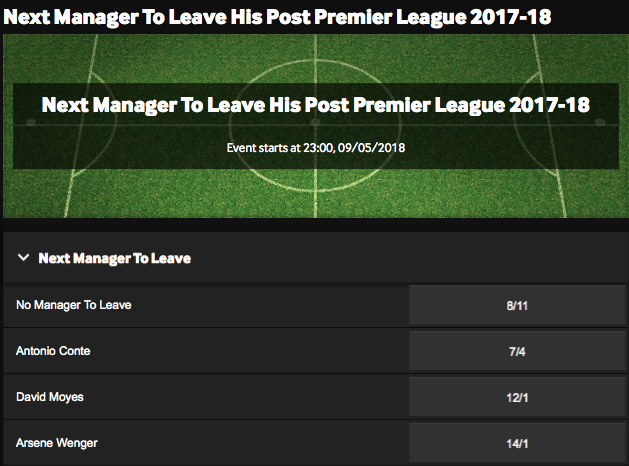 If they’re already at a club then having a cheeky wager on them being the Next To Leave might not be such a bad idea, potentially doubling that up by betting on them to be the Next Permanent Manager at that club. Social media and, in fact, the media in general can be a really useful tool when trying to figure out which manager might be about to get the sack or which one might be appointed if you know where to look. Heading to fan forums or having a look at some of the leading Twitter accounts of club representatives will give you an inkling of how the current manager is being perceived or which manager the supporters most want to see come in next. That doesn’t always work out, of course – just ask Chelsea supporters about Rafael Benitez if you don’t believe me. Yet fan unrest can be one of the first things that club owners will look at before sacking a manager. If attendances start to drop then don’t be surprised to see a manager’s future come under threat. Appointing the person that thew supporters want, as Newcastle did with Alan Shearer in 2009, can see those numbers rocket back up again. The phrase ‘Managerial Merry-Go-Round’ is something of a cliché in football, but it’s a cliché for a reason. At any given moment you can bet that the likes of Sam Allardyce, Roy Hodgson, Alan Pardew, Tony Pulis and David Moyes all seem to be in work, though which club it is that have them at helm is in a state of constant flux. If any of them are managing at a club then it’s worth having a look to see how long they’ve been there for and how things are going, with the assumption being that they’ll move on sooner rather than later. Likewise, if a club towards the bottom of the table has sacked a manager then you’ll see their names linked with the job almost immediately. If all else fails, betting on whichever one of them is out of work to get the job might not be the worst idea.